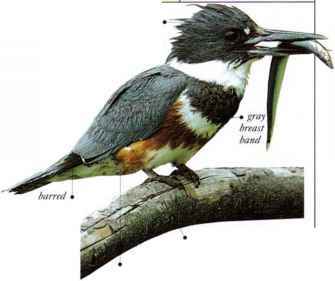 Common in a wide variety of habitats, this bird is found in arid scrub, open woodland, farmland, gardens, and towns. It flies rapidly with whistling wingbeats and has a characteristic upward flip of the tail after landing. Mourning Doves are seen in pairs or small, loose groups. When not breeding, they are seen in larger groups at feeding sites or roosts. The call is a mournful-sounding scries of coos. Birds feed on the ground, chiefly taking small seeds, and also grain and green shoots. The male's display flight consists of a noisy, flapping ascent followed by a downward glide. On the ground, displaying males how to the females with puffed-up necks. • NEST a scanty platform of thin twigs, sometimes lined with finer stems, usually in a tree or shrub. • DlSTRIBl ITION From the US-Canadian border area as far south as Panama, the N. Caribbean and the Bahamas. Northern populations migrate south within this range.